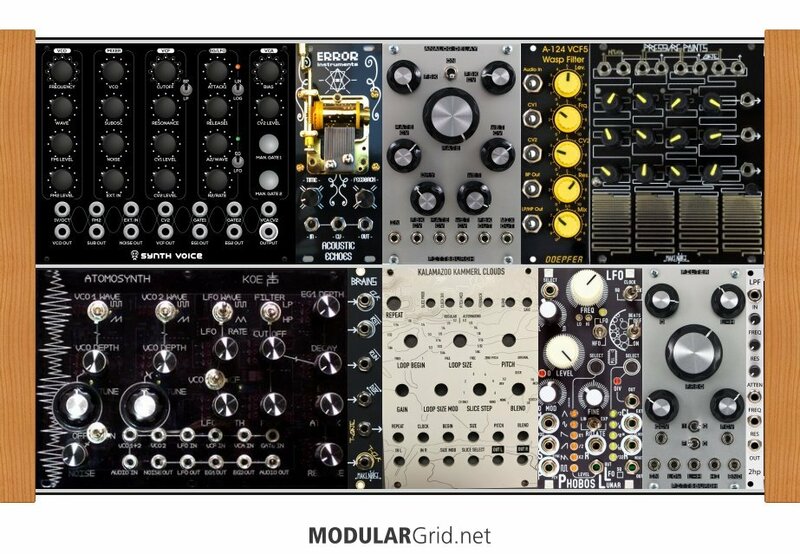 This is what I've got right now, I'm trying to build my own but I don't have a super solid frame of reference in spite of constantly looking at modules and playing with virtual ones. I want the top rack to be my brass and the bottom to be background atmospheric type stuff like a pad. Let me know if this will accomplish or any recommendations please!!! The key to getting decent brass-type pad sounds is in generating cutting-sounding sawtooth waves, adding a tiny bit of mistuning if you want an ensemble sound, and then not really filtering this much if at all. Amplitude envelopes are pretty much like gates: fast on, fast off, sustain at the desired level. It's pretty simple stuff; my Crumar starts with square waves and then reshapes those for the sawtooth...which also means it's not a 'clean' saw, which actually helps a bit since the wave is a bit non-linear and has a bit of a 'buzz' to it that adds brightness. Your build above seems to be going in a wholly different direction, actually...you need to think simpler to get brass sounds.